It is important that you make sure you have a current BC Fishing Licence before you get here! See the link below to get your licence online. Changes in the fishing regulations, going into effect April1/09, will have both Tunkwa Lake and neighboring Leighton Lake, open for fishing year round. Tunkwa regulations enable all legal forms of fishing including fly fishing, bait fishing, artificial lures and now ice fishing. The only fish species in Tunkwa Lake is Kamloops Rainbow Trout. Trophy fish in the 10 pound class with numerous smaller fish are caught each year. Our fish are very aggressive, and hooking one is just the start of the battle! These fish are famous for their incredible strength and jumping ability! Guests are welcome to view the “bragging board” in the resort store to see some of the great fish caught in the lake. We have over 1400 feet of shoreline with many great spots to fish from shore. We are very close to the Thompson River with it’s world renowned Steelhead Fishery, also known for good summer dry fly fishing. 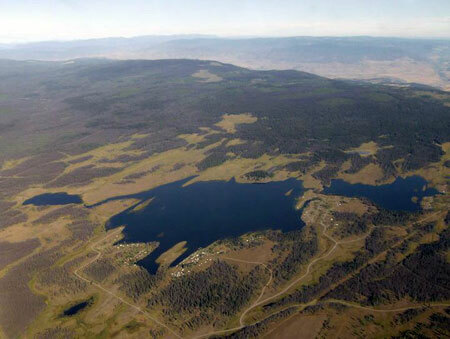 Our lake is famous for it’s incredible Choronomid hatches which make Tunkwa Lake Trout grow fast and strong. The Resort Store features locally tied custom and premium flies designed to entice Tunkwa lake Trout. Guests are invited to regularly check our website for updated fishing reports. Guests can bring their own boats or rent one from our fleet of large clean powerboats. As a reminder, the lake is restricted to 10HP or less. We offer guests a selection of popular local flies , fishing tackle and worms. We also have available a deep freeze to keep your fish in until you are ready to take your catch home. You can now get your B.C. Freshwater Fishing Licence online. Click this link to go there. List of B.C. Fishing Licence options.Click this link to go there.